’s their way to reach out and understand the world around them. As parents, it is important that we facilitate this curiosity. Enter Max & Ruby Science Educational Games from developers Tribal Nova, which promises to teach your child all about physical science through fun mini games. ’s book and animated series Max and Ruby by Rosemary Wells. Guided by the adorable siblings Max and Ruby, kids play fair-themed games that teach them two components of their core curriculum: the properties of liquids and the motion of objects. In the activity Water Blast!, kids drag and drop the missing pipes to complete a pipeline from the water faucet to a fair attraction. While playing, they also learn how to change the state of water, e.g. water to ice by freezing, and water to steam by heating. The activity comes in three levels, comprising 27 puzzles in total that grow progressively harder. For example, in higher levels the pipes can be placed in incorrect spots, preventing the water to flow. ’s attempt, and to unlock reward stickers. Should kids fail to complete the puzzle in the allocated time, the app encourages them to try again. The second activity, Ball-O-Rama!, introduces kids to the topics of force and motion. Here, kids pull back with their fingers to launch balls into holes. A red arrow appears when the ball is pulled back to project how far it will go. 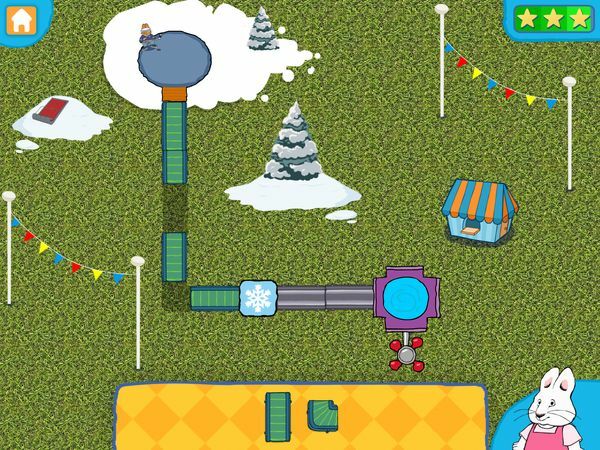 Just like Water Blast!, Ball-o-Rama also comes with 27 different puzzles to solve. The more difficult puzzles throw various obstacles to go around into the mix, as well as balls made from different materials that affect their trajectories. Finally, Make Believe! is an open-ended activity that allows kids to compose their own Max & Ruby scenes using the stickers they earned in the other two activities. This creative section not only provides kids with a well-deserved break, but also acts as an incentive to keep them going back to the puzzles to earn more stickers. Max & Ruby Science Educational Games is free to download on the App Store. The initial download includes the first 5 levels (or stickers) of each activity. If you like what you see, the full game can be unlocked for a one-time purchase of $3.99. ’s progress in the app. Up to four child profiles may be tracked in an account. ’s other apps are protected by way of tap-and-hold lock mechanism which (in my experience) is quite effective. ’t realize they are actually learning important early educational skills. What I like best about the app is that it is intuitive enough for kids to work out on their own. Animated instructions are provided at the start of each activity, as well as helpful tips from Ruby throughout the games. I also like that despite being timed, the games do not feel stressful. The app also has plenty of positive encouragements to keep kids motivated. The short clips shown at the end of the puzzles make nice rewards, as well as the stickers and build-your-own-scenes activity. Max and Ruby make such adorable hosts, even kids who are not familiar with the show will surely like them. Max & Ruby Science Educational Game is a fantastic app that makes learning physical science so much fun. Kids will learn about the properties of liquid and the motion of objects through simple, hands-on activities guided by the adorable Max and Ruby. Overall, I would highly recommend this app for kids ages 3–6.